Back when Coastal Expeditions was a fledgling company, there wasn’t anyone else doing what we were doing along the South Carolina coast. And in 1992, the internet wasn’t a resource like it is now (not even close). So while we were planning our routes and developing itineraries, we were having to gather the information as we went, writing it down in notebooks, recording information about put-ins, paddling distances, camping spots and directions as we collected it. We quickly realized that we needed a resource that allowed us to view all of this on one page. The Delorme Gazeteers and DNR maps that we were using gave us some of the information we needed, but it wasn’t great, and it was too difficult having to refer to different pages and maps to get where we were going. We were looking for something that combined all of the information we needed- marked water trails, roads, landings, national forests, protected lands- so that we could easily take it with us and use it as an expedition resource. This map became the answer to our needs. Only we had to create it. Anne Gould, the founder of Coastal Expeditions overlaid the information that we had collected over years and made this invaluable resource. This map wants to be used, wrinkled, smeared with pluff mud and worn out. 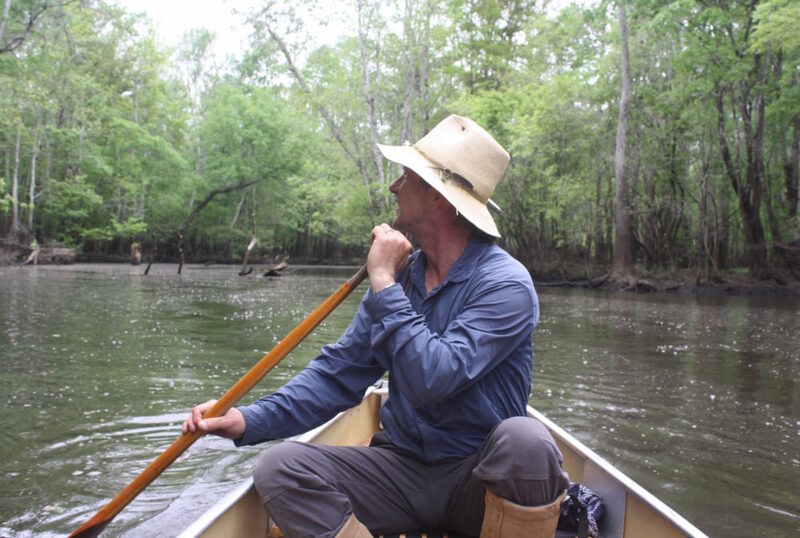 And what often gets lost in all of this is that the original crew at Coastal Expeditions, a group of genuine Lowcountry dirtbags and funhogs- Chris, Pete, Tonya, Anne- were doing first descents in sea kayaks down many of these waterways and exploring areas that had long been forgotten. And they used this map to guide them along the way. The map gets tucked into the visors of our trucks, stuffed into our backpacks and stowed on our boats. Whether we’re on an afternoon paddle or a multi-day camping trip, it is one of the first things we pack. Since the Coastal Expeditions Map was created, we haven’t put it down. It’s the first thing we pull out when we’re planning a new itinerary- whether it’s for a new Coastal Expeditions excursion or heading out for an adventure on our own. While not a chart or GPS, it is a great starting point because it overlays roads and water trails, giving you the information you need of how to get to your starting point, where to put in your kayak, canoe or boat or where you can camp. And unlike a phone, you don’t have to worry about being out of range or having a dead battery. Grab a couple so you can keep one on the boat and one in the house. Give it as a gift to someone that loves to opt outside. This map wants to be used, wrinkled, smeared with pluff mud and worn out. Don’t disappoint it.